ALBANY – Grace Barbara (Healey) Yund, 93, of Albany, died peacefully on Friday, April 13, 2018 surrounded by her loving family at St. Peter’s Hospital. Born in Watervliet, Grace was the daughter of the late William J. Healey and Wilhelmina R. (Pickett) Healey. As the top secretarial graduate from Watervliet High School, she went to work the day after she graduated. It was on a blind date that Grace met her future husband, the late 1st Lieutenant, USMC, Theodore J. Yund, who she adored and was happily married to for 61 years. The joy of Grace’s life was raising her fourteen children with a deep focus on love, family and faith. In return, she was blessed with 41 grandchildren and 13 great-grandchildren. She had an extraordinary gift to make everyone feel unique and special, as she cherished time with family and friends. Grace spent many summers in the Adirondacks with Ted and her children where she would often start her day with a morning swim. 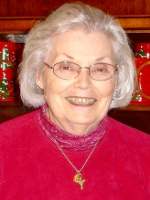 Grace played the piano and organ, frequently attended daily Mass, prayed the rosary, and spent countless hours cooking for her family while continually opening her heart and home to extended family and friends. Her delicious turkey dinners were a renowned favorite among those who gathered at the family home on Brookline. Grace spent her final years residing at the Teresian House where she was cared for, comforted and loved by staff and fellow residents as she gracefully suffered with Alzheimer’s disease. Mrs. Yund is survived by her children Mary Grace McCarthy (Walter)-Grand Island, George Yund (Colleen)-Schodack, Barbara Crecca-Clifton Park, Joseph Yund (Ann)-Birmingham, AL, Teresa MacDaniel(Philip)-Locust Grove, VA, Elizabeth Sarris (John)-Toms River, NJ, Peter Yund (Laura)-Marietta, GA, Margaret Demeter(David)-Delmar, Anne Yund -Queensbury, Catherine Averill (Thomas)-Saugerties, Regina Annello(Christian)-Wynantskill, and John Yund (Kimberlee)-Guilderland; her brothers Paul Healey-Watervliet and Joseph Healey(Barbara)-Florida and sister-in-law Eileen Yund-Boston; and many loving nieces and nephews. She was predeceased by her husband, Theodore, sons Theodore and Michael, son-in-law Nicholas Crecca, her brothers William, James, and Thomas Healey, brother-in-laws Charles and Walter Yund, sister-in-laws Jean and Betty Healey and Arabelle Oses, and nephews Tommy and Kevin Healey and Chuckie Yund. Funeral services will be held in the Hans Funeral Home, 1088 Western Ave., Albany, Thursday, April 19, 2018 at 9:30 am, with funeral Mass following at 10:30 am at St. Vincent DePaul Church, Madison Ave., Albany. Relatives and friends may call at the funeral home Wednesday, April 18 from 4-8 p.m. Interment will be in the Gerald B.H. Solomon Saratoga National Cemetery, Schuylerville. In lieu of flowers, memorial contributions may be made to The Teresian House, Memorial Fund. To leave a message of condolence for the family or obtain directions to the funeral home, please visit www.HansFuneralHome.com . My most sincere condolences to the Yund family. May her peace be eternal. Our thoughts and prayers are with you. We’re so sorry for your loss. May your mother (mother-in-law and grandmother) rest in peace. When someone you love becomes a memory, that memory becomes a treasure! Condolences to the YUND FAMILY. Prayers r being said,especially for former co-worker George. May she rest in peace. Condolence to the Yund family. Grace and Ted were such great neighbors and made us feel so welcome when we moved in. Jane and I will miss all of the family. Gracie was a very dear friend and neighbor. Our thoughts & prayers are with all of you. We were so blessed to have “Grace & Ted” as neighbors & friends.